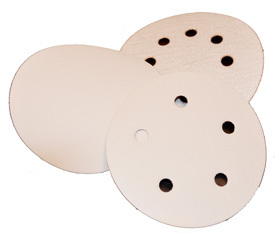 These are premium aluminum oxide paper discs typically used with dual action sanders. They come in two diameters, 5" and 6" and six vacuum hole patterns. Be sure you order the correct size and hole pattern for your tool. You may need to expand the list to see all of sizes and grits. The discs on this page are sold in cases of 200 discs. You can click on the link in left margin for box of 50 pricing.